Reading and share top 24 famous quotes and sayings about Hard Life by famous authors and people. 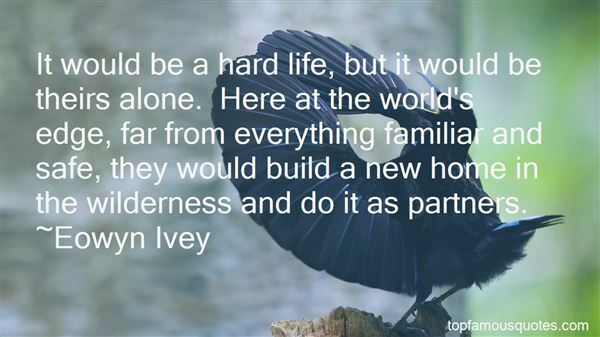 Browse top 24 famous quotes and sayings about Hard Life by most favorite authors. 2. "After us they'll fly in hot air balloons, coat styles will change, perhaps they'll discover a sixth sense and cultivate it, but life will remain the same, a hard life full of secrets, but happy. And a thousand years from now man will still be sighing, "Oh! Life is so hard!" and will still, like now, be afraid of death and not want to die." 3. "When a soldier complains of his hard life (or a labourer, etc.) try giving him nothing to do." 4. "But I want people to understand that poker's not all glamorous, it's not all being on TV and making tons of money. It's a hard life. It's a lot of travel. It's a lot of weird hours." 5. "It would be a hard life, but it would be theirs alone. Here at the world's edge, far from everything familiar and safe, they would build a new home in the wilderness and do it as partners." 6. 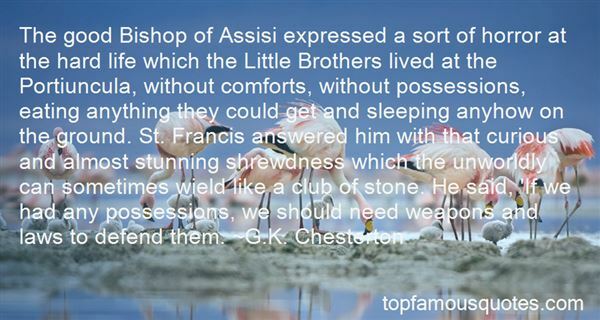 "The good Bishop of Assisi expressed a sort of horror at the hard life which the Little Brothers lived at the Portiuncula, without comforts, without possessions, eating anything they could get and sleeping anyhow on the ground. St. Francis answered him with that curious and almost stunning shrewdness which the unworldly can sometimes wield like a club of stone. He said, 'If we had any possessions, we should need weapons and laws to defend them." 7. "My kids idea of a hard life is to live in a house with only one phone." 8. "He had chosen a hard life... or perhaps he should say that a hard life had been chosen for him"
9. "He had a charm about him sometimes, a warmth that was irresistible, like sunshine. He planted Saffy triumphantly on the pavement, opened the taxi door, slung in his bag, gave a huge film-star wave, called, "All right, Peter? Good weekend?" to the taxi driver, who knew him well and considered him a lovely man, and was free. "Back to the hard life," he said to Peter, and stretched out his legs.Back to the real life, he meant. The real world where there were no children lurking under tables, no wives wiping their noses on the ironing, no guinea pigs on the lawn, nor hamsters in the bedrooms, and no paper bags full of leaking tomato sandwiches." 10. "It was hard work-a hard life-but now that she was about to leave it she did not find it a wholly undesirable life." 11. "A bird painted not with beauty but with all the dirt and wounds collected in a long hard life, in battle, in love, with torn feathers and a busted leg and a chipped beak and one of its eyes half closed; and yet a bird of deeper loveliness for all of that." 12. "There was pain, but there was also joy. It was in the tension between the two that life happened. Imperfect as it was, this world was real. Illusion was no substitute. I'd rather live a hard life of fact than a sweet life of lies." 13. "I think I've lived a pretty hard life. What I mean by hard is that... I've been kind of reckless with things. I'm a passionate person. I'm a super passionate person. I think there's definitely been sorrow in my life, good and bad. I think it comes through. I hope it comes through in my writing because to me that's what artistry is." 14. "Cause it's a hard life, with love in the world. and i'm a hard girl, loving me is like chewing on pearls." 15. "It was a very hard life. As I got older, the family was depending very much on me. My two older brothers got married, so they had their own families depending on them. I had seven people relying on me, so I worked in a grocery store." 16. "Life is hard, Pat, and children have to be told how hard life can be...so they will be sympathetic to others. So they will understand that some people have it harder than they do and that a trip through this world can be a wildly different experience, depending on what chemicals are raging through one's mind"
17. "Drizzt felt the despair most keenly. For all the trials of his hard life, the drow had held faith for ultimate justice. He had believed, though he never dared to admit it, that his unyielding faith in his precious principles would bring him the reward her deserved. Now, there was this, a struggle that could only end in death, where one victory brought only more conflict." 18. "I think you've had a very hard life," Passion said calmly, "and you see everyone and everthing through a lens of mistrust." - Passion to Marcus"
19. "There's a hard life for every silver spoon.There's a touch of gray for every shade of blue.That's the way I see life.If there was nothing wrong...Then there'd be nothing right." 20. "I always heard that immigrants had a really hard life when they came to America." 21. "It's a hard life as a professional cricketer. It's not as easy as everyone makes out. To survive you need a tough hide." 22. 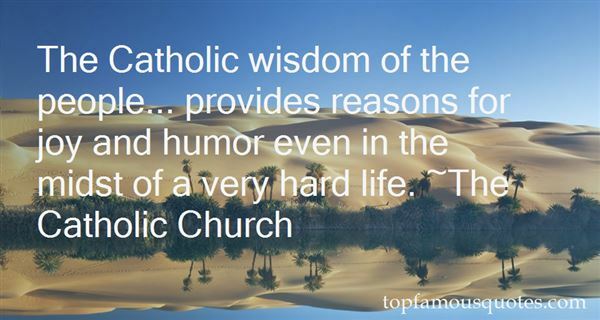 "The Catholic wisdom of the people... provides reasons for joy and humor even in the midst of a very hard life." 23. "Yes, long hours and a hard life for my parents, but for a six to seven year old every new day dawned with fresh excitement when you have not a care in the world, and so much to learn and witness." 24. "It's a hard life sometimes and the biggest temptation is to let how hard it is be an excuse to weaken"
Women must be the spokesmen for a new humanity arising out of the reconciliation of spirit and body."